Siriki Dembele of Peterborough United is fouled by Dean Parrett of Gillingham to win a penalty. Photo: Joe Dent/theposh.com. Flying Peterborough United winger Siriki Dembele is delighted to back and determined to help his side into the League One play-offs. 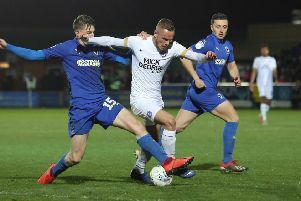 The 22 year-old claimed the sponsors’ man-of-the-match prize on his first start since February 2 as Posh beat Gllingham 2-0 at the ABAX Stadium yesterday (April 6). Siriki Dembele of Peterborough United in action against Gillingham. Photo: Joe Dent/theposh.com. Dembele was the man fouled to win a penalty that Marcus Maddison tucked away for the crucial opening goal of the game just before the hour mark. 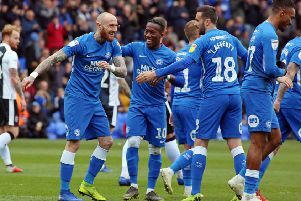 Posh remain seventh in League One, five points behind sixth-placed Doncaster, ahead of two tough away games at eighth-placed Blackpool (April 13) and Fleetwood (April 19) who are 11th. “It was fantastic to be back,” Dembele enthused. “Six weeks off might not seem a long time, but when I wake up every morning I want to play football so it was a long time for me. “I’ve enjoyed the season and I’m happy with how I’ve played, but now it’s all about making the play-offs. We are all highly motivated to do just that. We are focussed on our own results as we can’t control what anyone else is doing. “The pressure has been on us because we started the season so well. If we’d started more slowly and just made steady progress people would be more relaxed and say we are in a very good position which we are. “We didn’t play great in the first-half yesterday, but we were better in the second-half. “It was definitely a penalty against me. I think I would have scored if he hadn’t pulled me. He tipped me off balance just as I was about to shoot. Posh signed Dembele from League Two Grimsby last summer. He’s made 41 appearances scoring seven goals and being credited with seven assists.